But what if one of your usual papers gets it wrong? We are talking about the Financial Times (FT) read by so many in this town. We have always been (and will remain) the ones defending the FT against comments from other journalists and diplomats. (It seems that a mixed feeling of envy and criticism surrounds the FT in the Brussels bubble.) We think that the FT is coping well with its large influence and subscribes to high standards. But they are human, too, and fallible. The European Council took place yesterday (we have also blogged about it), with historic decisions on European energy policy. Since the Treaty of Lisbon the rotating presidency is not chairing the European Council, so the presidency decoration is removed from the Atrium of Justus Lipsius for the duration of the European Council. This happened to the Belgian decoration and the HU Presidency has done the same. In our case, a green rug has been laid over the widely (and sometimes wildly) interpreted historical carpet. Another function of this cover was to protect the underlying carpet from further damage. The big screens in Atrium were delivered in a heavy truck before the summit and they are being removed probably just now (Saturday morning) the same way. This truck has reportedly caused some physical damage to the carpet already, we will see its extent on Monday. Kovács and Kováts have tirelessly explained this to journalists in the Atrium during the “idle” hours of the European Council, but the FT has been able to get it wrong on their Brussels blog. This brings us to our point: There have been some wild interpretation and conspiracy theories in the past about the carpet. We hold that opinion is a personal issue and all should feel free to interpret the carpet as they wish. But we also hold that facts should be respected. - The often-mentioned map on the carpet (not the only map on the carpet) is a map of central Europe with the Austrian Habsburg Empire in the middle from 1848. The map of “Great Hungary” (people usually refer to this as of 1867) is nowhere to be seen. 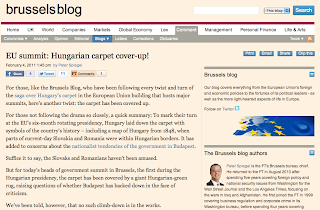 This is a fact, anyone writing about map of “Great Hungary” or Hungary is factually wrong. - Presidency decoration can no longer remain in the Atrium during European Council meetings. It must be removed (or covered in our case). No matter what is its “history”. - It was a Slovak MEP, not a Hungarian one, who lamented the thought of people walking over famous historical figures on the carpet. 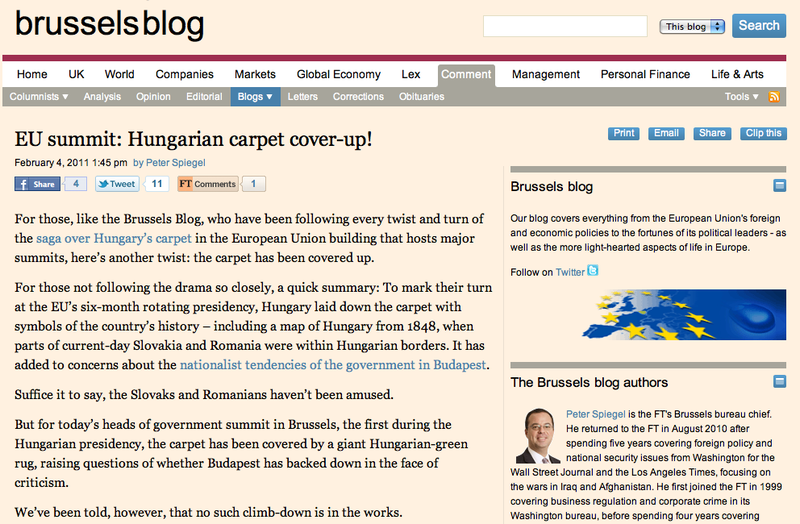 If the Financial Times made this "mistake" in Hungary, how many million of forints would it be fined under the repressive new media law? Anonymous, you're right, we are not going to react to that comment. It's completely off topic and manifestly biased, so what would be the point of saying anything? We are into debate and an exchange of ideas, not trolling. So you were right to be curious, Curious observer, K&K did what everybody expected, they refused to to talk about their embarassing initiative with that media law.